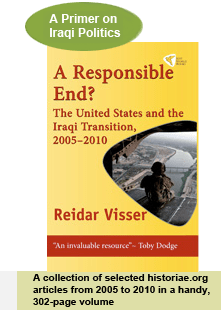 For a long time, the idea of an externally imposed ethno-sectarian partition of Iraq was the preserve of a few relatively isolated but loud US politicians and pundits, including figures like Joseph Biden, Leslie Gelb and Peter Galbraith. More recently, however, certain academics have added their voice to the partitionist propaganda. These studies warrant close scrutiny, because their academic style and, in some cases, elaborate footnotes, make it very likely that they will achieve status as “serious pieces of research” among those who advocate partition… Full story here.